I’m pretty serious about making caramels, so it should be no surprise that I own a cookbook dedicated solely to caramel. This Classic Caramel Sauce is so much richer and more flavorful than the stuff that comes from a bottle or jar at the grocery store. The most difficult part of making caramel sauce is watching it intently and stirring (and refraining from stirring) at just the right times to make sure it doesn’t burn. So, if you feel like you can dedicate half an hour to watching caramel cook, give this recipe a try. I like making this caramel sauce a bit thicker than the original recipe calls for and using it for a glaze on cakes. I drenched my Norwegian Sour Cream Pound Cake in caramel sauce below. In a 1-quart saucepan over medium heat, bring the cream to a boil. In a 3-quart heavy-duty saucepan combine the sugar, water, and honey, and cook over high heat until the mixture comes to a boil. Brush around the inside of the pan with a damp pastry brush at the point where the sugar syrup meets the sides of the pan. Do this twice during the cooking process to prevent the sugar from crystallizing. Cook the mixture over high heat, without stirring, until it turns amber colored (6-10 minutes). The darker amber the sugar mixture is, the fuller flavored the caramel will be. David Lebovitz recommends caramel to be the color of an old copper (US) penny. I tend to err on the side of the caramel being darker colored, but I make sure to watch the caramel carefully as it can start to burn in a matter of seconds. Lower the heat to medium and slowly add the hot cream to the sugar mixture while stirring constantly. Use caution as the cream will bubble up and foam. Continue stirring to make sure there are no lumps. Stir in the butter until it’s completed melted. Depending on how thick you like your caramel sauce, you can take the sauce off the heat at this point (it will be quite runny), or you can keep cooking it over medium-low heat for another 2-5 minutes until it thickens a bit. When I drizzle caramel sauce over my cakes as a glaze, I continue to heat it for at least 5 minutes until it reaches the desired thickness. After the caramel sauce has been removed form the heat, stir in the vanilla extract. Transfer the caramel sauce to a bowl, cover tightly with plastic wrap, cool sightly, and server warm. Note: The caramel sauce can be stored in a covered container in the refrigerator for up to 2 weeks. Slowly warm in a microwave or over a double boiler until it is a bit more fluid before use. With so many baking options out there, typically I don’t like to make a recipe more than once or twice. But I make an exception for this Norwegian Sour Cream Pound Cake recipe which holds a permanent place in my baking repertoire. As a plain pound cake, it has a dense but tender vanillay crumb that is anything but “plain”. The batter also holds up well to a variety of mix-ins and flavorings. My favorite combinations are an addition of cake spice for a dash of zing to the flavor and butterscotch chips for a bit of caramel. And if I’m feeling extra decadent, I’ll pour a homemade caramel sauce over the top. 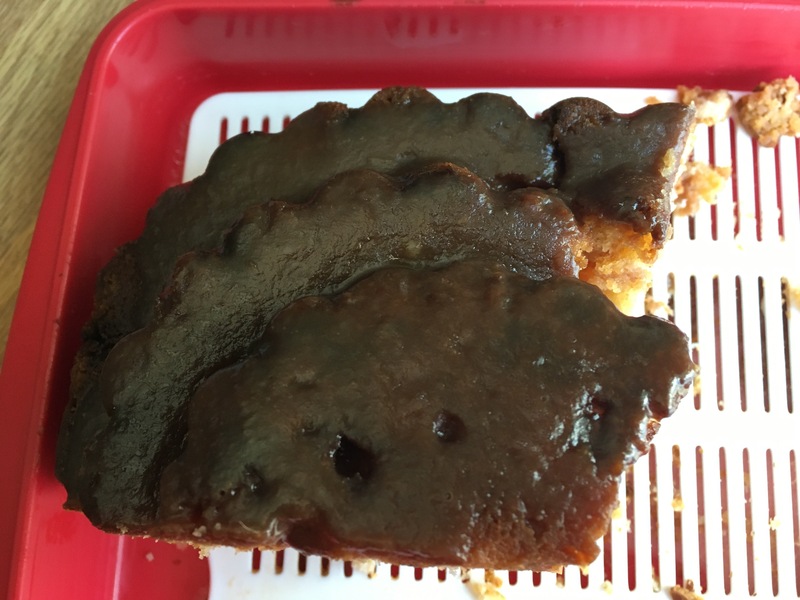 An overhead view of the cake drenched in a dark caramel sauce. A side view of all the goodness. 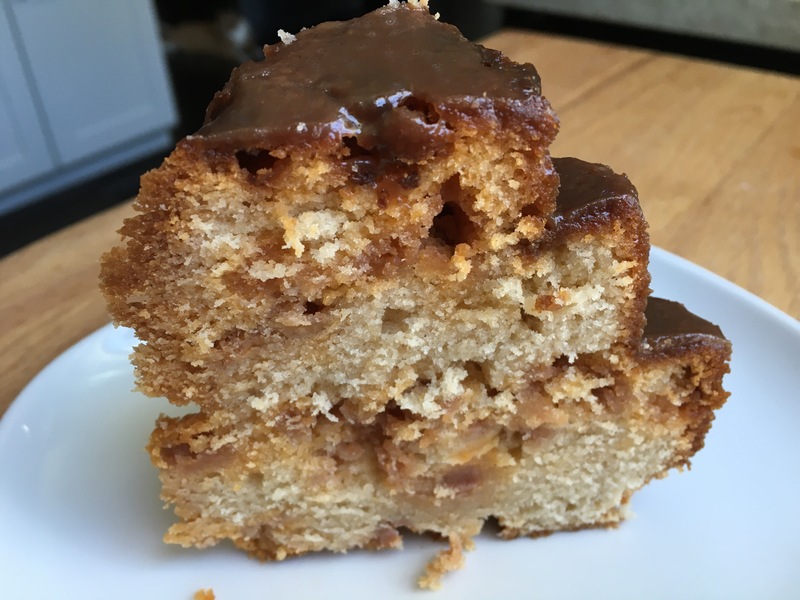 The butterscotch chips create little pockets of caramel flavor in the cake. Lightly grease a full-size (10″) tube pan, bundt-style pan, or angel food pan. In a large bowl, stir together the flour, salt, baking powder, and cake spice (optional). Set aside. Add the flour mixture alternately with the sour cream to the wet ingredients. Start with adding the flour about 1 cup at a time and then the sour cream 1/2 cup at a time. Mix at medium speed between additions, until ingredients are thoroughly combined. The finished batter will be quite stiff/thick. Stir in the butterscotch chips (optional). Scrape the batter into the prepared pan, leveling it with your wet fingers or a spatula. Bake the cake for 55 to 75 minutes, until a cake tester, bamboo skewer, or long toothpick inserted into the center comes out clean. Don’t overbake to ensure that the cake is moist and tender. Remove the cake from the oven, and gently loosen its edges from the pan. After 15 minutes, carefully turn the cake out of the pan onto a rack to cool. Note: The cooled cake can be stored, well wrapped, at room temperature for several days. For longer storage, wrap securely and freeze. When I moved to my house almost a year ago, my yard was mainly grass and concrete. One of the first things I did was plant some fruit trees (peach, plum, and nectarine). In the meantime while I try to patiently wait another year until my trees yield fruit, I get an extra jolt of excitement when friends surprise me with fruit from their mature fruit trees. The latest food gift was 2 pounds of ripe, sweet black figs from a 20 year old tree. I don’t usually bake with figs, but this unexpected gift inspired me to make Fig Bars topped with a pecan crumble. Somehow the soft, buttery bottom crust manages to support a thick, juicy layer of fig jam while the nutty, sweet pecan crumble provides a bit of crunch and holds everything in place. That said, this is one of those recipes where if you love figs, you’ll absolutely love this recipe, but if you’re just mildly into figs, this one might be fig overkill for you. Heat the oven to 350°F. Prepare an 8×8-inch baking dish by lining it with parchment paper or lightly grease. In a food processor, grind the pecans with 2 Tbs. of the sugar until fine; remove and set aside. Put the flour, the remaining 1/4 cup white sugar, the brown sugar, salt, and baking powder in the food processor and process until blended. Add the butter to the food processor and process until the mixture looks crumbly. Add the egg yolk and vanilla and pulse until the mixture is wet and clumping, about 30-40 seconds (it won’t form a ball). Pack two-thirds of the dough into an ungreased 8×8-inch baking dish; set aside the other one-third of the dough. Bake until the dough is lightly browned and keeps a slight indentation when you press it lightly, about 15-25 minutes. While the crust is baking, coarsely chop the figs. Put the chopped figs in a nonreactive skillet with the sugar, and cook over medium heat, stirring occasionally, until the juices have reduced and the fruit is tender and thick, about 15 minutes. Stir in the lemon zest, add the lemon juice to taste, and set aside. Note: If not using right away, refrigerate in a closed container. This fig jam keeps for weeks, so if you like, make it well ahead of time. In a mixing bowl, crumble together the remaining dough with the reserved pecan and sugar mixture. Gently spread the fig jam on top of the baked crust. Sprinkle the dough mixture over the filling. The top will look crumbly. Bake until browned on top, about 25-35 minutes. Cool completely before cutting into bars 1-1/2 inches square. Note: The bars keep well for about a day or two. They’ll get a bit too mushy and soggy after that. I’ve had a recipe for crawfish etouffee on my “must make” list for 9 years (!!). The recipe was on my cooking bucket list for so many years because I never knew where to find crawfish tails, but recently I found frozen ones at an Asian market (H mart). The recipe for crawfish etouffee was from a friend of a friend, and it looked so simple that I thought that there must be more to this dish. A quick google search yielded Emeril’s recipe which was very similar to the recipe I had. So I combined the two recipes, and the results were delicious. Thaw and lightly rinse the frozen crawfish. Drain and lightly dry the crawfish, and set aside. Dissolve the cornstarch or flour in 1 cup of water or stock, and set aside. Add the onions, green pepper, and celery to the melted butter, and sauté until the vegetables are softened (about 10-12 minutes). Add salt to taste. Add the cayenne pepper, black pepper, and white pepper and stir to combine. Add the tomato sauce and bay leaves, and stir gently to combine. Add the cornstarch and water mixture. Stir until the mixture thickens, and simmer for about 5 minutes. Add the crawfish to the vegetable mixture, and sauté until heated through. Stir in the green onions, and continue cooking for 2 minutes. Serve over steamed long grain rice.